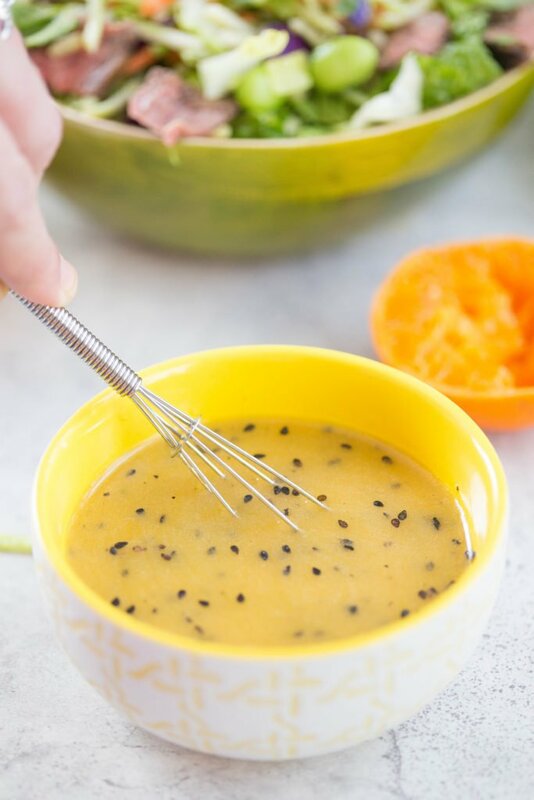 Mandarin Orange Ginger Dressing doesn’t have a ton of ingredients, but don’t let that fool you! 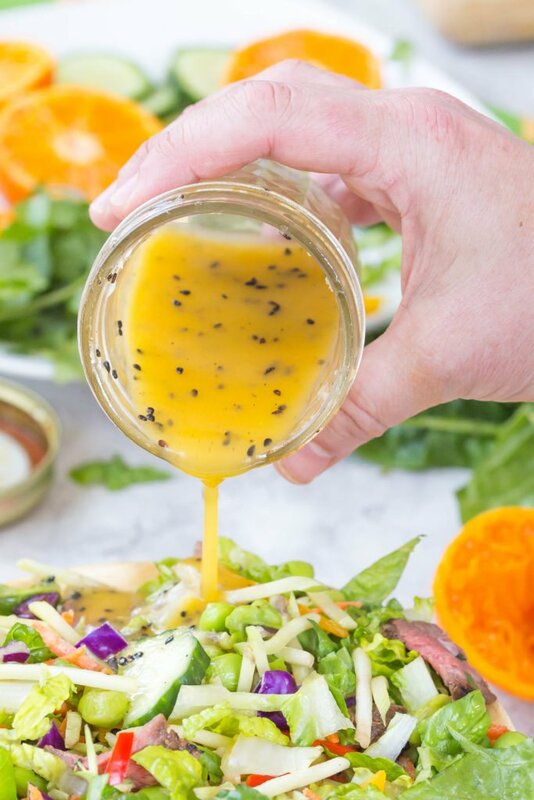 This easy homemade dressing recipe boasts an explosion of bright, citrusy flavor that you’ll want to pour on all of your healthy eats! Mandarin Orange Ginger Dressing has become my new obsession. It’s sweet, citrusy, bright and flavorful, and an extra zing of WOW comes alive when you taste the fresh ginger. I do a lot of meal prepping and lunch packing at my house, and I love having homemade salad dressings on hand in the fridge. Citrus based vinaigrettes don’t just act as a finishing touch for salads. No sir! 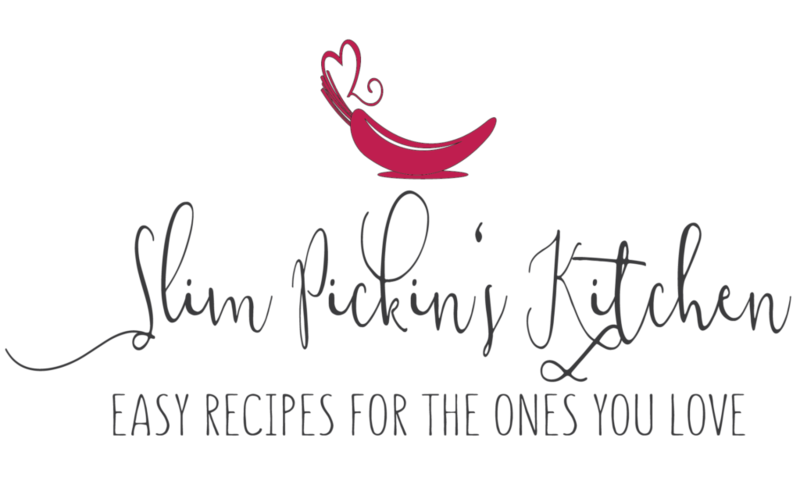 They’re also fantastic meat marinades, sandwich sauces, and dippers for fresh veggies and wraps. Homemade salad dressings are one of the easiest recipes to make. They’re literally nothing more than 1 part acid + 3 parts oil + mix ins put into a glass jar and shaken to high Heaven. As seen before in my mimosa vinaigrette, I never play by the rules, and I tend to lean more towards a 2 parts acid + 2.5ish parts oil because, well, I like to taste the vinegar in my homemade vinaigrettes. I also always add dijon mustard to the majority of my homemade dressings because it acts as an emulsifier. 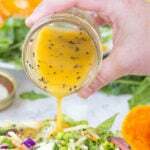 The mustard keeps the vinaigrette nice and blended so the oil and vinegar stay married instead of going their separate ways. 1/2 (or full) tbsp fresh ginger You can use the squeeze kind, if needed! Zest one mandarin orange into a small glass jar w/ a tight fitting lid. Squeeze the juice from the mandarin oranges into the jar w/ the zest and then add the vinegar, ginger, dijon mustard, honey, salt and pepper, and oil. 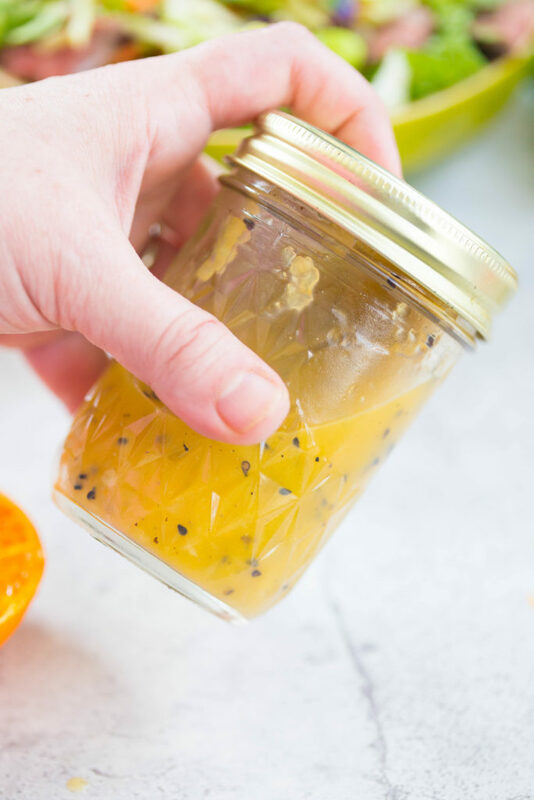 Tightly secure the lid to the jar and give it a good shake, shake, shake until the dressing has emulsified or become slightly thick and smooth. Taste the dressing, adding more ginger if needed, then stir in the sesame seeds. Pour over your favorite salad or serve as a dip for veggies. Homemade vinaigrettes w/ add ins like garlic and ginger can generally remain in the fridge for up to a week, but we all know they won’t last that long!